I’m heading to Punta Cana next month for a friend’s beach wedding and as excited as I am about spending six days in the sun with Chris and getting to see some of my blogging friends, I’m a little nervous about being in a bikini for almost a week…I gained ten pounds over the summer (damn that Italian gelato!) and I’ve just barely started to lose it! After working so hard this year to lose thirty pounds, I am finding it’s even harder to lose the weight I’ve gained back! I went and bought some of the new Lean Cuisine Honestly Good frozen meals from Target to help me stay on track with my weight loss. Because this picture of us in Saint Thomas? It’s embarrassing. And I do not want a repeat of this in Punta Cana! So it’s time to cut back on the cookies and get down to business. There is no such thing as too much water! I drink water all day long, every day. I begin meals with a big glass of ice water. I drink water as soon as I wake up! Keeping my belly full of water helps reduce my appetite, and staying hydrated makes me feel pretty good too! Stock your fridge full of fruits and veggies – the kind you know you’ll eat! If you buy baby carrots and no sweets, what are you going to eat? The carrots. Don’t buy the stuff you know you shouldn’t be eating, it’s really as simple as that. If you really want sweets, you’ll end up having to bake them yourself, and that homemade sweets are usually much more healthy than that mass-produced, processed crap in the grocery store. Find healthier alternatives to your favorite snacks. I make all kinds of substitutions to make my baked goods healthier and less fattening. I usually use applesauce in place of butter or vegetable oil, I buy no sugar added ice cream, add my own fruit compote to vanilla yogurt – little changes like these can really add up and yield big results over time! I’ve recently discovered baked apple chips, which totally satisfy my craving for crunchy treats. Instead of potato chips, try eating apple chips or popcorn instead! Lean Cuisine just launched this brand new collection of Lean Cuisine Honestly Good meals that feature six varieties of all natural, wholesome ingredients. They’re not your ordinary frozen meals, either! These Honestly Good dishes are really tasty and there’s even sauces that you add yourself! I found quite a few varieties of the Lean Cuisine Honestly Good meals in the freezer aisle at Target, and they were just $4.69. For less than five dollars, I was pretty surprised at how tasty these meals were! The new Lean Cuisine Honestly Good meals are: Honey Citrus Chicken, Lemongrass Salmon, Pineapple Black Pepper Beef, Plum Ginger Grain-Crusted Fish, Pomegranate Chicken, and Roasted Red Pepper Chicken. It’s not that I don’t know what to cook to help me lose weight. It’s just that Chris and Angeline don’t exactly get excited about low calorie dishes. And who wants to make two separate meals every night for dinner? I did that for months when I was working on losing that thirty pounds, and I am so over it! It’s so tempting to just eat what they’re eating for dinner, so I really need something on hand that I can prepare for myself without a loss of hassle. Lean Cuisine Honestly Good meals are made with no preservatives, no artificial ingredients and are minimally processed. I love that I can eat these meals and feel good about it – there’s no guilt associated with eating something that isn’t made from quality ingredients! There’s a little social good going on with Lean Cuisine too! Together with their farmers, they’re donating a portion of the vegetables grown for LEAN CUISINE HONESTLY GOOD meals to local communities! It was a dreary, rainy day in Miami when I decided to make it for lunch and it totally brightened up my day! 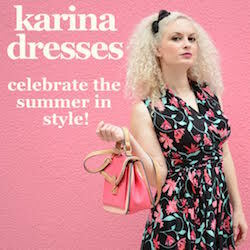 « Win $1000 in Dresses in the Karina Dresses #Dresstacular Event! Those Lean Cuisine meals do look really yummy. i have a similar picture and I totally get it. good for you for getting on top of it! p.s. love that lean cuising is basically doing the portion control for you! efficient and effective. I have no doubt that you will look fabulous on your trip. I eat Lean Cuisine for lunch all of the time. I really like them! Honey, embrace your beautiful body! Enjoy the blogging wedding of the year! And yes, that Lean Cuisine line, which I honestly tried at Blogher13 is delicious! You look fantastic. Great tips to share too. I also LOVE Lean Cuisine. I’ve been doing a lot of Progresso soups. But I just ate some Doritos – Bad, bad, bad!! Punta Cana sounds like it will be faaaabulous! I love your tips and are ones that I try to incorporate. I shoot for 100 oz of water a day and put my fruits and veggies in snack sized bags so that they are easy to reach for and grab. These Lean Cuisine meals look delicious. I’ll have to get some to keep on hand for work! These are very good tips! I also need to get moving more, I’m so sedate! This is a great way to still keep to a healthy eating plan but fits into the schedule of someone who is busy with meetings, busy with family, busy with …well life! This is something I grab and have on hand for my lunches! Sometimes I don’t want to cook or need something quick! I love the way they taste!! I’ve put some weight back on, and this time of year is hard for me. 🙁 But honestly, you look good, Jenn!